Discover the Ile de la Cite and the magnificent monuments present here, like the Notre Dame Cathedral, Saint Chapelle and La Conciergerie on this guided tour. Witness some of the greatest feats of architecture, along with some of the finest works of art on display. Climb the magnificent Notre Dame Towers on your own and catch amazing sights of Paris from your incredible vantage point! With live commentary from a local guide, enjoy fascinating stories about the tiny island of Ile de la Cite that are worthy of a novel. Explore the world-renowned Notre Dame Cathedral and its numerous sights! Enjoy a skip the line entry to the stunning Sainte Chapelle, and witness one of the greatest collections of stained glass artwork in the world! Visit the prison cell that Marie Antoinette spent her last days in, at the La Conciergerie. Climb the towers of the legendary Notre Dame Cathedral on your own with your pre-purchased tickets! The city of Paris was founded at the site of the Ile de la Cite, situated on the Seine River. It is the heart and historic center of the city and houses some of the most well-known monuments of Paris. 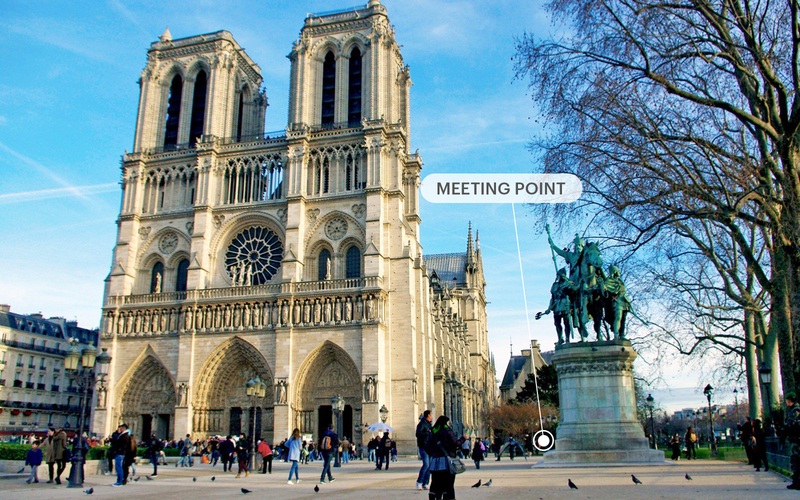 Your day will begin with a guided tour of the Notre Dame Cathedral, the point from which distances to all places in France used to be measured. The majestic structure is spectacular to behold from the outside. The rose windows seem quite ordinary at first, but when you see the stained glass from the inside, you will be rendered speechless. The numerous statues, gargoyles and chimeras are wonderful additions to the already marvellous structure. The Sainte Chapelle is undoubtedly the star of the tour. Commissioned by King Louis IX, it used to hold some of the most important relics in Christendom, including the Crown of Thorns placed on Christ’s head during his crucifixion and some of the relics of the Passion. Its incredibly detailed stained glass windows are some of the most beautiful and stunning artistic feats in the world. The skip the line entry will save you a significant amount of time, owing to the fact that the chapel is one of the most popular tourist spots in France. The last monument is the La Conciergerie. Located right on the banks of the Seine, it was originally a part of the old royal palace, the Palais de la Cite, which also included the Sainte Chapelle. During the “Reign of Terror”, it was turned into a prison. Marie Antoinette, the last Queen of France was also imprisoned in this building before her fateful execution. You can see her private cell as your guide tells you incredible stories and facts, heightening your tour experience. Finally, at the end of your tour, your guide will leave you with pre-purchased tickets to climb the towers of the Notre Dame at any time of your choice. Impressive views of Paris abound from the top. The true story of the hunchback will be revealed to you by your guide just as you part ways, capping off a wonderful experience in Paris! Best tour in Paris we ever had. Special thanks to Headout team for suggesting such wonderful tours to us! the tour had few people.So it felt quiet intimate and cosy to be a part of it. We were a group of like minded people who were enjoying admiring the beauty of the places. You will receive an email confirmation with your Skip the line Notre Dame & Tower Climb, Sainte Chapelle, & Marie Antoinette’s Prison Cell mobile voucher shortly. No need to print. Just show the voucher on your phone with a valid photo ID at the meeting point. This tour meets in front of the Charlemagne Statue (equestrian statue) found in the Notre Dame Cathedral's square. This is the only statue in the square, which will be situated on the right side of the Cathedral when facing the front facade. Your host will be waiting for you in front of the Charlemagne Statue holding a WALKS sign.